Could the red and blue lines that divide us also draw us together? Sports columnist and radio host Drew Deener begrudgingly contemplates. The assignment for this issue comes in. 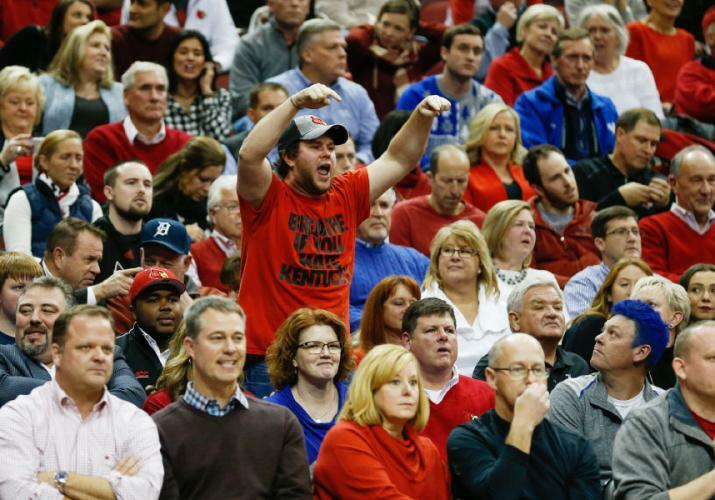 And it’s: “How does the UK-U of L rivalry make this city great?” My first thought was that I’m not sure that it does. That in this world of twitter, team-centric blogs, team-centric websites, and team-centric radio shows (I’ll plead guilty on that one), this rivalry has actually gotten so ugly that it may actually be making things worse. I even posed this question to my radio show host on Tuesdays, Billy Reed. For the uninitiated, Billy was probably the most influential member of the media in the early Eighties when the basketball series between the Cats and the Cards was dormant. He wrote column after column applying pressure on UK and Joe B. Hall who were resistant to the idea of a UK/ U of L annual series. And even Billy wondered if the ugliness that exists today could be making this rivalry a negative. That text did two things. 1) It sparked my memory 2) It was good natured rivalry ribbing with no malice. It sparked my memory because the rivalry definitely forges relationships. One of my first sports memories is being in Knoxville with my Dad and basically our entire small extended family in 1983 for the original Dream Game. Somehow, in a game that had to be one of the toughest tickets ever to get, my Dad had gotten 8-10 tickets. I sat a few rows from then-governor, John Y. Brown, and his half-blue, half-red jacket. Whatever my Dad spent on those tickets was worth every penny because I have never forgotten it until this day. Every person reading has a story from a road trip, or family get-together that has been centered around a UK versus U of L game. My guess is that you’ve had a heated argument around the holidays (perhaps after a cocktail or two) about the rivalry, and who has bragging rights that year. And while things can get ugly sometimes — especially in the social media world, I do believe the net result of this rivalry does make this city great. Arguing about it makes family members talk to one another. A great game on the road can reunite old friends to meet up together. Tailgating for a game can mean hours of comradery that can’t be replicated elsewhere. So, don’t take that post-game text too seriously. Plan a trip to a game. And, oh yeah, if you see my friend Jeremiah, remind him that U of L beat UK 73-70 in this year’s game.